Buy Cables to Connect your TV, Home Cinema or Computer System, Cheap Prices and Fast UK Delivery. HDMI has become the most popular way to connect a TV to a set top box, DVD or Blu Ray etc. Our range of HDMI products includes the lastest generation of High Speed Ethernet HDMI Cables, HDMI splitters to connector your HD source to mutiple screens and HDMI Switches to connect multiple device to one HDMI input. Our HDMI multiroom extender kits are a great way to watch Sky HD or Virgin HD on 2, 4 or 8 screens, they comprise of an HDMI CAT5/6 splitter and 2, 4 or 8 receiver units, these allow 1080p HDMI to be sent over a single ethernet cable up to 50m away. Sending HDMI over longer distances has become much easier with the use of our Active HDMI Cables and HDMI over CAT5/6 extenders, active cables have built in boosters to cover long distances and HDMI extenders use active technology to send the HDMI signal via cheap ethernet cables. The best way to connect your sound bar or surround sound system is using a digital audio cable, there are 2 mains types, coaxial cables and optical cables. 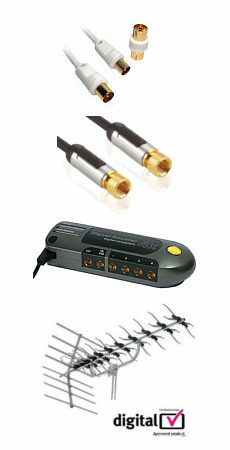 Digital coaxial cables have phono connectors and optical cables have toslink connectors. Toslink cables have square plugs with 2 corners chamferred and a central pin that carries the fibre. Both types of digital audio cable are capable of carrying multi-channel sound. If your sound bar or amplifier has an analogue input we also stock a full range of audio cables with 3.5mm and phono connectors. If your surround system or sound bar has a subwoofer or LFE connection then we have a range of subwoofer cables to connect a subwoofer. To connect your speakers to your hifi or home cinema amplifier we stock a range of oxygen free speaker multi-strand speaker cables and 4mm banana plugs, flat speaker cable is ideal for running under carpets where a thin cable is required. If you wish to use the TVs internal tuner for watching Freeview then the tv aerial needs to be connected to it, we have a range of tv aerial cables up to 50m long. All our aerial cables are suitable for analogue and digital TV including HD. Our male to female aerial cables are ideal if you need to extend a tv aerial cable. Sky HD, Freesat HD, Virgin HD and most other satellite receivers have screw type cables known as f-type, our satellites are are an ideal way to connect your wall plate to your set top box. To extend an existing satellite dish cable or virgin use our satellite extension cables. The most reliable way to connect a smart tv or computer to the internet is using an ethernet cable. Simply plug the cable into the socket on your TV or computer and the other end into your broadband router. CAT5e cables are all that is required for most users, if you are building a fast gigabit network we also stock CAT6 and CAT6A ethernet cables. There are 5 common types of cable for connecting computers and laptops to monitors or TVs. VGA cables have a 15 pin connector end (3 rows of 5) and carry an analogue monitor signal. DVI Cables have either 18+1 pins (single link DVI-D), 24+1 pins (dual link DVI-D) or 24+5 pins (dual link DVI-I). DVI-D cables carry only the digital signal whereas DVI-I can also carry the DVI-A analogue signal. Displayport cables have a 20 pin connector and although they look similar to HDMI are slightly larger, a smaller mini displayport cable is also available to connect smaller devices such as Mac Books, Microsoft Surface Pro etc.